Telluride Ski Resort is located approximately 200 miles southwest of Denver, Colorado, in the charming mountain town of Telluride. Once dubbed “To-Hell-You-Ride” from its mining town days, the town of Telluride was designated a National Historic Landmark in 1964. Telluride Ski Resort boasts incredible views of the San Juan Mountains and is home to more than 2,000 acres of lift-accessible terrain. 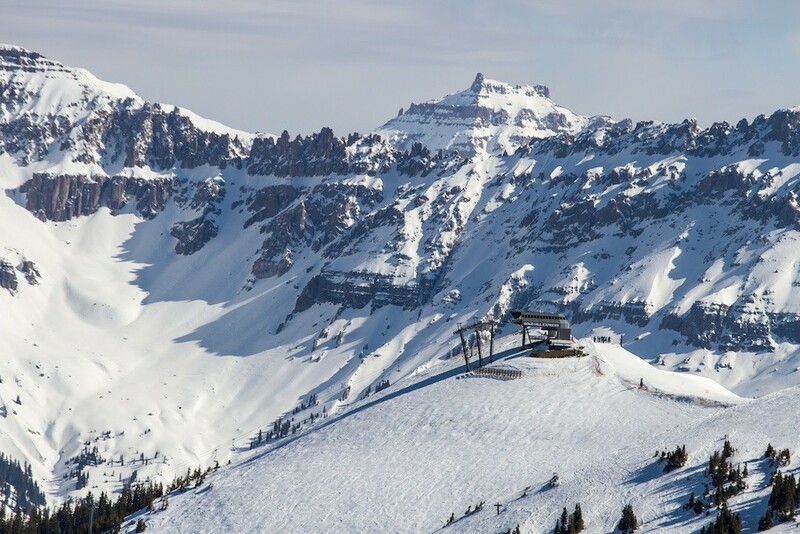 Telluride’s 4,425 feet of vertical is accessed via 19 lifts and 148 runs. With a lift-served elevation of 12,515 feet and a maximum elevation of 13,150 feet, the mountain has no trouble holding onto its snow. Telluride’s terrain ranges from beginner to intermediate, with four hike-to terrain areas for advanced and expert skiers. The ski area offers multiple terrain parks for all skill levels as well as 10 kilometers of nordic skiing. After the lifts close, head to town and enjoy the après spoils that make this town so unique; from summer bluegrass, beer and film festivals to world-class restaurants and lodging options, the party seems to never end. Summer activities include Jeep tours, golf, fly fishing, mountain biking and ropes courses. Telluride is located 65 miles from Montrose Regional Airport (MTG). For a more convenient travel option, visitors may fly directly into Telluride Regional Airport (TEX) through connecting flights out of Denver. The mountain’s terrain offers majestic views at its highest peaks for skiers and riders of all abilities, with in-bounds hike-to slopes located on Bald Mountain, the Gold Hill Chutes, Black Iron Bowl and Palmyra Peak. The Plunge is a classic run that has breathtaking views of the town of Telluride and the surrounding peaks while descending 3,140 vertical feet. The resort is renowned for steep and deep trails while providing a large amount of acreage for intermediates and beginners. Beginners should head over to the Sunshine Lift to enjoy meandering green and blue runs that are wide and generally less crowded. On a Telluride powder today, Olympian and local Gus Kenworthy suggests you wake up super early and put your skis at the front of the line for first chair, then go back to sleep, grab a coffee or breakfast, and return to click in just before the lifts open. From there, take lift 8 from town to lift 9, then head over to lift 6. Once the back bowls open, spend the day between Gold Hill and Prospect. Another good choice is to stick to the often-overlooked face of the mountain and get fresh tracks on lift 7. When you’ve worn yourself out, Kenworhty suggests stopping in for some chili in a bread bowl at the Saloon at Gorrono’s or taking it on down for après at Oak, right at the bottom of lift 8.